After an up and down freshman season that saw his team miss all postseason competition, Isaiah Whitehead bounced back with a much more impressive sophomore campaign, leading his team to a nine win turnaround and the Big East Conference Tournament championship before falling to Gonzaga in the opening round of the NCAA Tournament. He got into much better shape, made some key improvements to his game in the off-season and looked much more like a NBA prospect in his second year, which helped him make the decision to leave school early and declare for the NBA Draft. Measured at just below 6'5 with an impressive 6'9 wingspan (which is more than three inches greater than our last measurement from 2013) and a filled out 210 pound frame at the NBA Draft Combine, Whitehead has ample size and length to defend shooting guards, but plays on the ball so much that he will likely see quite a few minutes at point guard as well. He doesn't overwhelm the opposition with his physical attributes, as he is not an exceptional athlete, but he uses a mixture of basketball instincts and aggressiveness to make plays. An impressive scorer at 21.9 points per 40 minutes pace adjusted as a sophomore, Whitehead has struggled with his efficiency throughout his two collegiate seasons. Although his 52% true shooting percentage as a sophomore is actually a more efficient mark than his abysmal 48% true shooting mark during his freshman season, it still rates fifth worst among all players in our top 100 prospect rankings. He had free reign to run the offense as a sophomore, which led to some impressive scoring performances, but some equally poor stretches of reckless decision making. Always considered a combo guard from early on in his career, Whitehead is best attacking with the ball in his hands. Full of confidence offensively, he thinks he can score against anyone at any time. He will push the ball in transition, run pick and rolls and look to beat his defender in isolation. He can break the defense down with his ball skills by using a combination of fakes and hesitation moves, paired with strong ball-handling ability, but he doesn't have an elite first step to get past his defender, which means he has to stagnate the offense at times to get to his spots. Whitehead makes a heavy living on mid-range pull-up jumpers off pick and rolls or isolation opportunities, which is a difficult way to make a living, but he's able to do far better than most. Lacking the quickness to consistently get past the defense in these situations, he usually has to fall back on step-back jumpers and floaters over the rim protector once he gets inside the arc. While he did increase his accuracy on these shots last season from 29.6% to 38.6% these are still extremely difficult shots to make, and represent a large portion of his total field goal attempts (almost 30%) according to Synergy Sports Technology. This contributed to his mediocre 39% two point field goal percentage, which would make him just the fourth player in our database with a two point percentage below 40% in the year they were drafted. One area where he has improved is his ability to attack the basket, although he still has a ways to go with this skill set. He's still more likely to pull-up then get into the paint, but he's become more aggressive attacking the rim and has improved his ability to finish on runners (32.8%) and shots around the rim (44.2%) according to Synergy Sports Technology. He still ranks well below average in these categories compared to other NBA prospects, though. That's because when he does get all the way to the rim, he doesn't have great explosiveness to convert his attempts, but he is aggressive with the ball and puts pressure on the defense as they try to stop him. He got to the free line for an impressive 7.0 attempts per 40 minutes pace adjusted and since he can convert these at a 76% clip, he really helps himself put points on the board when he can't directly finish his drives. Possessing terrific basketball instincts, Whitehead has shown the willingness to find the open man, although he has room to improve in this aspect of his game as well. He puts a lot of zip on the ball, with some tricky no-look passes, but they aren't always the most accurate passes. While he averages 6.1 assists per 40 minutes pace adjusted, he also turns the ball over 4.2 times and has a negative 0.44 pure point rating. While he certainly has the ability to find his teammates when he draws the defense, he isn't yet a reliable offensive creator because of his inability to put his teammates in scoring position. Whitehead also improved as a spot-up shooter although he still prefers to shoot in rhythm off the dribble, with a much higher sample of jumpers off the dribble than off the catch. Even so, he showed he can add some production working off the ball, converting 35.2% of his catch and shoot opportunities according to Synergy Sports Technology. He will need to improve his mechanics, with his shot being a little flat from time to time, but being willing to work off screens or spot-ups will help his offensive profile, as this will be a way he can contribute without the ball in his hands. Defensively, Whitehead is somewhat of a mixed bag. He had a reputation for being highly indifferent on this end of the floor for most of his career, and this continued to show at times during his sophomore year, even if he got into better shape and seemed to put more focus in, which helped a lot. Whitehead can actually wreak havoc on his opponent when he is locked in by pressuring the ball, moving his feet well on the perimeter and using his length to make plays. He has the toughness and length to be able to defend either guard spots, even if can be a little too focused on the transition to offense which can cause his focus and energy to lag at times. He has a unique combination of defensive stats, contributing 1.7 blocks, 1.4 steals as well as 3.7 defensive rebounds per 40 minutes pace adjusted. While he will need to improve his fundamentals and intensity level to reach his full potential in this area, he shows the potential to develop into a useful defensive player if he continues to focus on this aspect of his game. The 21 year old Whitehead has his faults offensively and is still a frustrating prospect despite his improvements in his sophomore season. He is still prone to some wild shot selection and doesn't have the efficiency to overcome these decisions. That said, he could turn into a nice microwave combo guard scorer in the right situation as he is able to create his own shot off the dribble in the halfcourt. If a team can unlock his full potential and find a way to fit him into a structured offense, he could provide some nice sparks as a scorer and playmaker as he continues to shake his bad habits and buys into more of a team concept. Seton Hall guard Isaiah Whitehead works out in front of a myriad of NBA executives at the ASM Sports Pro Day in Las Vegas. 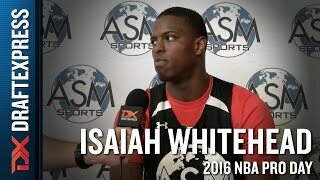 Isaiah Whitehead finished high school as a McDonald's All-American and the 11th best recruit in the class of 2014. 11 games into his freshman season at Seton Hall, the freshman combo-guard was a key player in Seton Hall's 9-2 start. Then, Whitehead missed the next nine games with a stress fracture in his right foot and struggled to regain his early season form upon his return. Making matters worse, rumors emerged that he was at the center of Seton Hall's chemistry issues that prematurely ended what looked to be a promising season and resulted in multiple transfers. With last season in the rear-view mirror, Seton Hall is Isaiah Whitehead's team to lead, and scouts will be watching to see how far the talented combo-guard can take the young Pirates. At 6'4 with a 6'5.5 wingspan and a 210-pound frame, Whitehead has solid size for a point guard position, but has an average frame for a shooting guard. While not a particularly explosive athlete, Whitehead shows an intriguing combination of quickness off the dribble and body control, although he still has a long ways to go to learn how to utilize that in an efficient manner. On the offensive end of the floor, Whitehead averaged 17.0 points per 40 minutes pace adjusted while seeing 21.2% of Seton Hall's possessions, but he did so shooting an abysmal 38.2% from 2-point range, and 35% for 3. Furthermore, he struggled mightily down the stretch, posting single figure scoring numbers in four of his last 10 games. Only two players in our extensive historical database (Josh Selby and Andrew Harrison) have ever been drafted after posting such a low 2P%, so Whitehead will have to improve that significantly to give himself a chance at developing into a NBA player. In terms of his NBA prospects, Whitehead showed glimmers of promise operating out of the pick-and-roll. He looked particularly good at utilizing screens, showcasing his quick first step, above average ball-handling skills, and solid instincts to create space for himself. When he looked to score, he showed glimpses of ability pulling up off of the dribble, stepping back for a deep jumper, and taking the ball to the rim. The issue, here, is the absolute mediocre efficiency in which Whitehead was able to score as a freshman. He struggled badly finishing around the basket, and was a below average jump shooter for the frequency in which he looked to hoist up shots. While he demonstrated solid body control and made the occasional acrobatic layup, his average size, explosiveness, length, and questionable decision-making ability limited his effectiveness as a scorer inside the paint, converting just 42% of his looks inside the paint, one of the worst rates among draft prospects. As a sophomore, he must also get to the free throw line at a higher rate, and find a way to become a better finisher and decision maker in traffic. Whitehead's struggles offensively weren't restricted to his ability to convert inside the paint. He made just 30% of his overall jump shots as well. While his shot selection is undoubtedly poor, his inconsistent shooting mechanics don't help much either. Whitehead struggles to find his rhythm as a spot-up shooter and his balance and variable release point complicate his otherwise intriguing ability to create shots off of the dribble. While Whitehead had little trouble creating his own shot as a freshman, scouts will be watching to see if he can become a more effective and efficient scorer as a sophomore. Whether or not Whitehead can develop as a point guard also remains to be seen. On the one hand, he averaged 5.0 assists per 40 minutes pace adjusted and frequently demonstrated solid court vision and instincts as a distributor, off of the dribble and out of the pick-and-roll. On the other hand, he must refine his overall instincts considerably. In particular, Whitehead never looked comfortable as primary ball handler and his frequent tunnel vision and tendency to force passes in Seton Hall's half court offense contributed towards his standing as one of the most turnover prone players in our database. While Whitehead's offense left scouts with plenty of questions, he made up for his inconsistency with a decent effort on the defensive end of the floor. While his awareness, attentiveness and fundamentals all can stand to improve, he showed to be a solid defender when matched up in one on one situations, due to his effort, intensity, and his willingness to use his body to his advantage, even though his combination of lateral quickness and length looks average with an eye toward the NBA. He appears to have good instincts on this end of the floor, though, forcing turnovers at a solid rate, and should be able to develop nicely in this area if his conditioning improves. While Whitehead's freshman season went about as poorly as he could have imagined from both an individual and team perspective, he still has some things to work with long term with his impressive scoring instincts, body control, creativity and defensive potential. Already turning 21 towards the end of the season, and thus being a year or more older than many NCAA sophomores, scouts will closely monitor the kind of year he has, particularly if he proves capable of taking a big step forward as a sophomore. While his physical profile may limit his ceiling at the next level, his skill set distinguishes him as one of college basketball's most versatile combo-guards and scouts will be watching to see if can maintain his productivity with improved efficiency and decision making as a sophomore. As the likely focal point of Seton Hall's offense, Isaiah Whitehead should have plenty of opportunities to prove that he is still worthy of consideration as an NBA player. -Is he a point guard or a shoot guard? -Sometimes settles for long jumpers. -Long, slow release on catch and shoot jumper. Outlook: Smooth, versatile combo guard who is very advanced for his age. Shows a good feel for the game and the ability to do a bit of everything with the ball. Has a very promising future if he continues to work on his game and is able to drown out the noise around him.